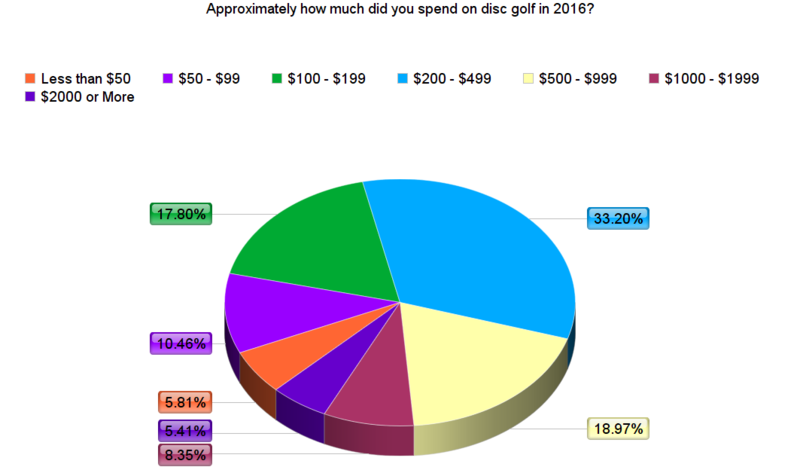 As you can see, the majority replied that they spent between $200 and $499 on disc golf in 2016, with the next largest groupings made of people who spent slightly less than that, or who spent up to $999. If you put those three highest groups together, then you have almost exactly 70% of respondents spending between $100 and $999 on disc golf during the year. By looking at the answer choices, you’ll noticed that the spread became larger as we moved to higher dollar amounts, so the first three choices went from $0 to $199, where the latter four choices covered from $200 to $2000 or more. Thus it was natural that more people would fall somewhere in the middle. But what might seem surprising is that 13.76% of respondents claim to have spent $1000 or more on disc golf in 2016, and 32.73% spend $500 or more on disc golf in 2016. That’s a respectable percentage of players that are spending a significant amount of money on disc golf. How Did We Spend that Money? Undoubtedly some of that money is spent on discs, bags, and other accessories. But one factor which could likely tally the higher expenses which would take players into the $500+ categories are things like tournaments and travel. Let’s look at responses that shed some light on the costs of tournaments. So, with 73.1% of respondents who played in tournaments in 2016 (the vast majority), and those tournaments all have registration fees. And then we figure that 63.4% of players would travel 4 hours or more to play in a tournament, it makes sense that significant travel and tournament play is a contributing factor in disc golf spending. In fact, 22.7% of survey respondents said that they’d “go anywhere” to play a tournament. That implies fuel costs, boarding costs, and more. Looking at these survey results, it would appear that many players are quite conservative when it comes to buying discs. We can see that 42.5% purchase between 0 and 9 discs. If you average a cost of $12 per disc (some are much more expensive, and some are less), then you’re looking at an investment under $100 or just over that amount on discs in a year. Once we move into those people who bought 10-29 discs, which is a collective 40.1% of those surveyed, then we can estimate that they spent at least in a range of $120 – $350 on discs during the year. Even though disc golf is an inexpensive sport compared to many others out there, where most courses are free to play, and equipment costs are very low, the truth is that players find ways to spend money on the sport they love. If not in buying discs and equipment, then in tournaments, travel, league fees, and more. Those spending choices are not a bad thing when it comes to the growth of disc golf. The fact that so many players are slapping money on the barrel for equipment, accessories, and tournament support means that disc golf can continue healthy growth, with more opportunities for players, and a growing body of enterprise surrounding the sport we love. First off, great intentions here to help legitimize disc golf! But I have some critiques. What is your sample here? You don’t disclose this, at least within this article. I feel this is a bit irresponsible. When you ask the question “Did you play in at least one tournament in 2016?” and only about 27% say they haven’t and only play recreationally, this is VERY misleading. Past and present industry leaders like John Duesler and John Houck among others believe that most disc golfers are ‘recreational’. We don’t have rock solid data yet, but one thing seems pretty clear from my experience (playing in different regions over 20 years and interviewing disc golfers form my thesis): The vast majority of disc golfers are recreational players who don’t play in tournaments. And a lot of them are very good disc golfers, who buy lots of discs. Although its probably safe to say that “tournament” disc golfers spend more money on the sport. I think you can certainly be an ‘avid’ and skilled disc golfer without ever having played a tournament. Here in South Tahoe we are getting ready to administer tourism focused surveys at our local courses to capture a cross section of everyone who plays a course on a given day and try to understand their motivations. Moving forward we have to be careful about response bias when conducting surveys because avid tournament players most likely play more often, more rounds, so the interviewer is more likely to capture their responses on site… Perhaps the opinions of these players should carry more weight when planning and designing disc golf courses? This is a tough question. This involves a lot of forward thinking about the future of disc golf and its image, purposes. These are statistics gathered from the State of Disc Golf 2017 survey with more than 9000 individuals surveyed. Our data is gathered through that survey, which reaches across the entire country, and also includes many players from outside the USA. Of course, you could say that the data is tainted, merely because it only includes responses from those who care enough about disc golf to A) fill out a survey, and B) actually hang out online where the survey takes place. So yes, it will always lack representation from the most casual of players because those casual players don’t feel excited enough about disc golf to take a survey. As far as taking snap-shots form many local areas, we are unable to do that because we don’t lack the resources to hit individual areas, plus we are more interested in the more sweeping trends across the disc golf community in general. Whenever you take that broader look, you can see the general trends, attitudes, and interests, but of course that will not represent everybody, everywhere.